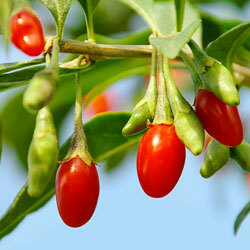 Touted by some as the “fruit from the fountain of youth” because of its high antioxidant, carotene and essential amino acids content, the goji berry (Lycium barbarum), also creates a large sensation in the garden. Additionally, it’s easy to grow in zones 3-10 (even in seaside locations!) and doesn’t need a second plant for cross-pollination as it is self-pollinating. Is this super plant right for your garden? In its natural form, this vigorous vine sprawls along the ground but training it to grow vertically is tidier, more space efficient and will protect nearby plants from overcrowding. Tie it to a strong stake, espalier along a wall or train along another framework for an attractive 8-10′ long plant and easier harvesting of the berries. Full sun exposure produces the most fruit. In areas where summer temperatures exceed 100⁰ F, provide afternoon light shade. It thrives in alkaline soil with a pH from 6.8-8.1. Add lime to the soil to increase the pH, if necessary. Regular watering and light fertilizing, along with light pruning to maintain its shape and appearance, are all that’s necessary to grow your own goji berries. If your space is limited, grow goji in a container. Container growing produces fruit earlier, makes it easier to maintain the soil pH and easily manages the vine’s size. Moreover, it’s quite attractive. Because the taproot grows deeply, be sure to choose a frost-proof container at least 18″ deep and 18″ diameter or larger. In the spring, bright red-orange berries follow lavender bell-shaped flowers. Since birds love the fruit, cover with netting to protect it so it can ripen fully. The berries turn red before they reach their full ripeness. Allow the berries to remain on the plant prior to harvesting to develop the best flavor. The best way to tell if they’re ripe is to eat one. When the tart taste becomes sweeter, they’re ready. Use the fresh berries in salads, sauces, juices or soups, or experiment by adding them to favorite jam recipes, infusing water or creating crushed fruit spreads. Alternatively, preserve your berries by drying or freezing and you can enjoy them long after the harvest ends. At first frost, the plant becomes dormant and the leaves drop. They’re hardy to -18⁰ F. When the temperatures rise to 50⁰ F, the leaves and fruit begin anew. In warmer areas, then, the growing season will be longer and you can enjoy goji berries even more, while in cooler zones you will have a shorter season, but one that is just as sweet. If you have questions or need assistance choosing your goji berry, soil or container, our friendly staff is always glad to help.